The main gate that used to lead to the Cat & Fiddle. I was with with my brother and my nephew last week when we decided to go to the Cat & Fiddle for dinner. What a shock to find out that they were closing the place down. Apparently the owners are looking for a new location, but at this point they haven’t found anything. When I dropped in a couple days ago, the restaurant was almost cleaned out. 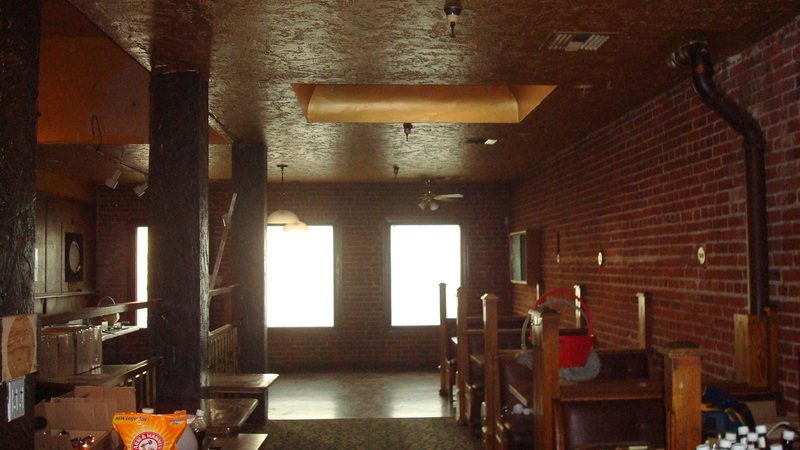 I’ve had so many good times at the Cat & Fiddle, hung out there with so many good friends. It was strange to be standing there, surrounded by boxes and furniture. Nobody sitting in the booths. Nobody standing at the bar. No music. No conversation. Just silence. 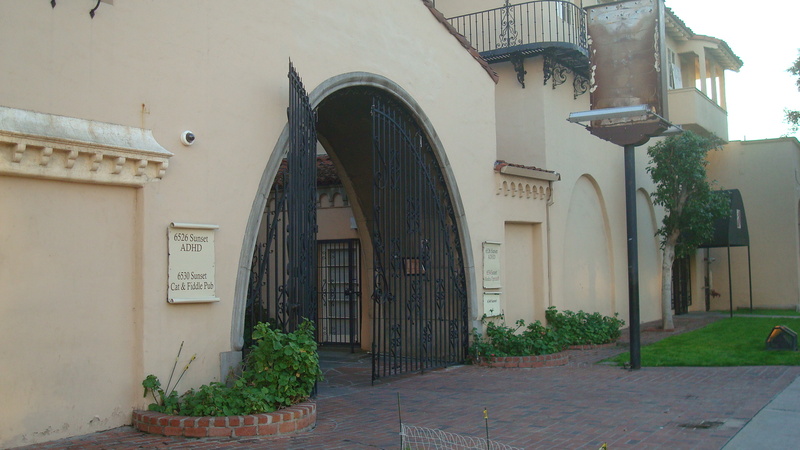 According to the LA Weekly, the building was purchased by its current owners, an investment group headed by Jesse Shannon, in 2005. When the Cat & Fiddle’s lease was up, apparently Shannon wouldn’t consider renewing it. At this point he has not revealed who the new tenant will be. No doubt one more upscale bar/club/restaurant of the type that’s been spreading like a virus through Hollywood for the past decade. Shannon does say that his group plans to spend millions to renovate the building. This is good news. I hope he’s serious. The building is a beautiful example of the Spanish Colonial Revival style, with some very cool Churrigueresque decoration. I hope the money Shannon spends is matched by a real desire to restore the building, rather than to make it a glitzy magnet for club-hopping kids. A few links. The first is to the story in the LA Weekly. Next, a link to a Facebook page that was created in the hope that the Cat & Fiddle could stay at its old location. It has some photos that show how full of life the place was. And last, an article on LA Eater in which Shannon talks about the reasons for not renewing the restaurant’s lease. I look forward to checking out the next incarnation of the Cat & Fiddle whenever it finds a new location, but I’m really sad to see it leave the building on Sunset. Sad because it was such a great place to hang out. And also sad because it’s just the latest casualty of the gentrification craze that’s sweeping through LA. The new tenant may have an amazing menu and a fabulous bar, but I seriously doubt it will have one tenth of the character that the Cat & Fiddle had. A photo of the Cat & Fiddle from September of this year. 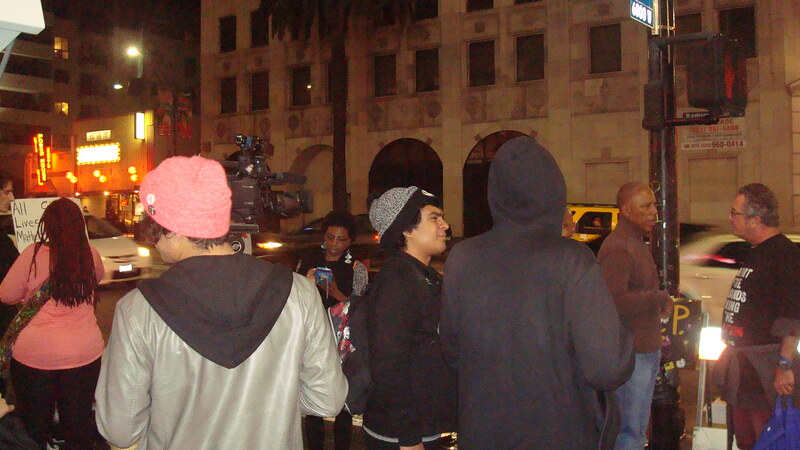 A recent protest at the corner of Hollywood and Highland. Nationwide demonstrations against the use of deadly force by police offers have been going on for months. Protests erupted again after grand juries decided not to file indictments in both the Michael Brown and Eric Garner shootings. If you haven’t seen them on the streets, you’ve seen them in the news. There’s widespread outrage over the fact that police continue to use deadly force against unarmed men, and that our legal system seems incapable of holding anyone accountable. It’s not just in Ferguson and New York that unarmed men are dying at the hands of the police. The LAPD has still not offered a concrete reason for stopping Ezell Ford as he was walking down the street near 65th and Broadway. They claim he reached for an officer’s gun before he was fatally shot. In Echo Park, David Martinez went out to buy some tacos for his family, and used his cell phone to call 911 when he heard gunshots. When police arrived on the scene, they shot Martinez himself, and months later he died from his injuries. This article from the Daily News offers details on recent shootings by the LAPD, and the resulting protests by angry citizens. Protests are good for expressing outrage and drawing attention to an issue, but protests will only go so far. At some point you have to start thinking about concrete measures to bring about change. That’s exactly what the South Central Neighborhood Council has done. On December 16, the SCNC voted to pass the following resolution…. Be it therefore resolved that the South Central Neighborhood Council calls upon Councilman Curren Price to introduce a resolution to the Los Angeles City Council to place on the ballot an amendment to the Los Angeles City Charter establishing democratic, community control over the Los Angeles Police Department through an all-elected, all-civilian, police control board with full authority over the department in all aspects at all levels. They’re absolutely right. The LA Police Commisson has not been effective. They can hold hearings and talk about solutions, but they have no real power to change anything. We need an elected body that has the authority to effect change within the LAPD. This isn’t just a matter of prosecuting officers involved in shootings. We need to change the culture within the Department. We need elected representatives who will insist on accountability. The SCNC deserves credit for taking this action. I hope Councilmember Price, and the entire City Council, take this up in the near future. And if they don’t, there are other ways to push this forward. I don’t think we’d have any trouble getting enough signatures to put it on the ballot. Got this in my e-mail this morning. More bad new for those who care about LA’s history. WHAT: Demolition of the 100-year-old Oswald Bartlett House is set to begin today and members of the community are expected to be present to document and bear witness to the house’s undeserved and sad destruction in the middle of the season when Jews and Christians celebrate – instead of destroy – their history and traditions. WHEN: Demolition work is set to begin at 7 am, today, Thursday, December 18, 2014. BACKGROUND: The Oswald Bartlett House has been recognized by preservationists as a pristine and rare example of architect A.C. Martin’s work. Martin, one of Los Angeles’ leading architects in the first half of the 20th century, designed LA City Hall and a half-dozen other notable structures now designated as landmarks. The Bartlett House was designed by Martin for a friend and is a rare example of Martin’s youthful work in domestic design; his more lasting reputation was founded on his design of major public and religious buildings. 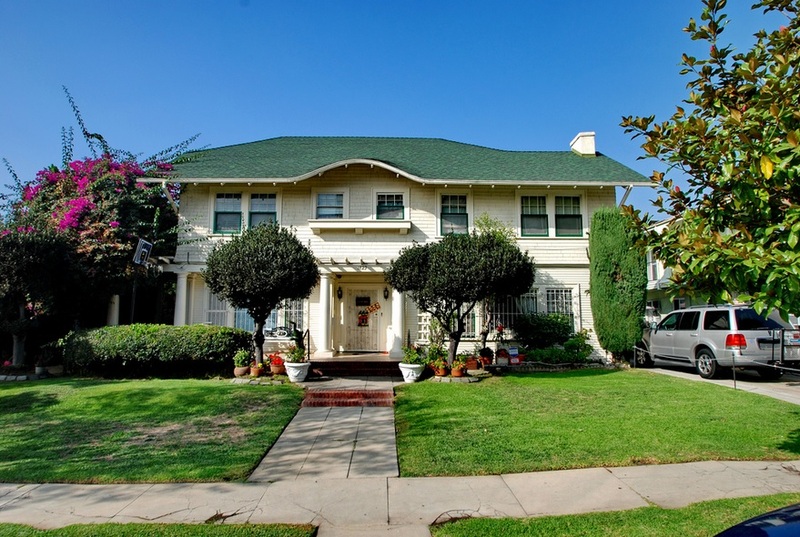 Despite the recognition by experts of the cultural and historic significance of the Bartlett House, City Hall turned a deaf ear to the experts (including the LA Conservancy) and community’s appeals to spare the house from demolition to make way for a six-unit townhome project whose building entitlements were gained through misrepresentations about the historic nature of the Bartlett House. 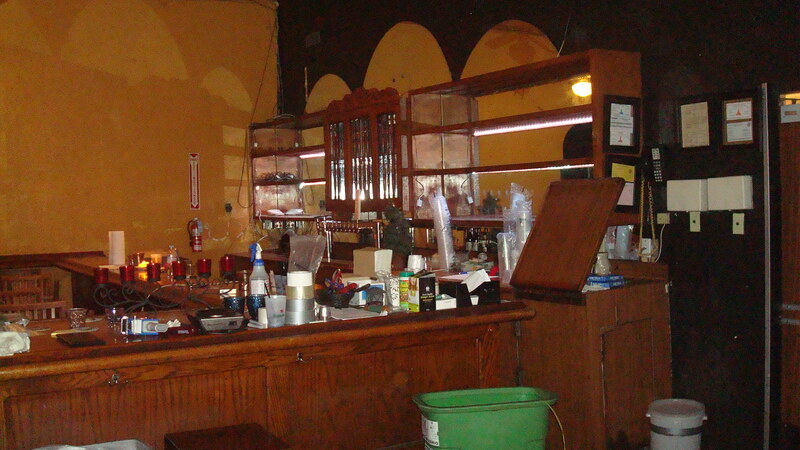 Last Wednesday the City Council gave the developer, a business ally of one of Mayor Garcetti’s top campaign fundraisers, the green-light to proceed with demolition. Today the sledgehammers and bobcats will start taking the house down. So one more historic building bites the dust. Garcetti seems determined to let developers have their way, no matter the cost to the city’s cultural heritage. 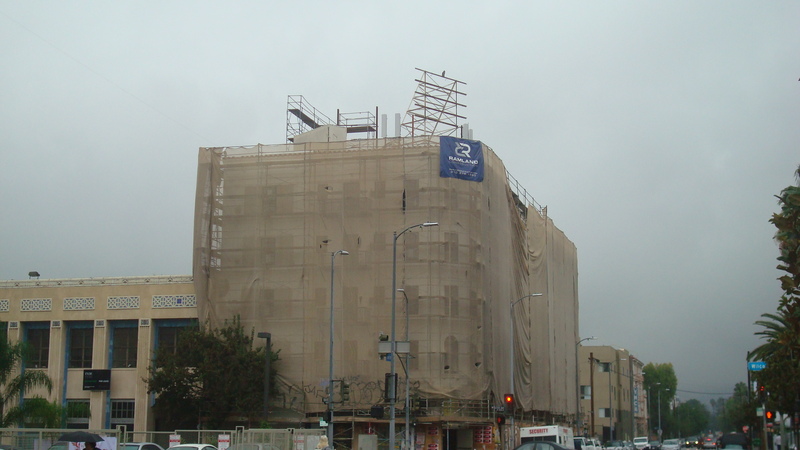 Some of you may remember that the Mole-Richardson building on La Brea was recently demolished, in spite of the fact that it was a classic art deco building by Morgan, Walls and Clements. If you missed that story, here’s a link to a piece on Curbed. 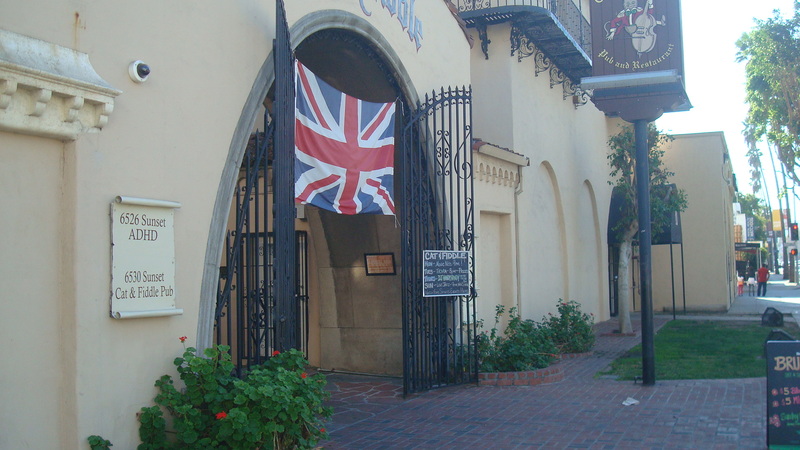 Other historic structures currently being threatened are the Warner Pacific Theatre, the Mosaic Church, and the Chase Bank building at the corner of Sunset and Crescent Heights. But who cares about history, when you can have a shiny, new mixed-use skyscraper? 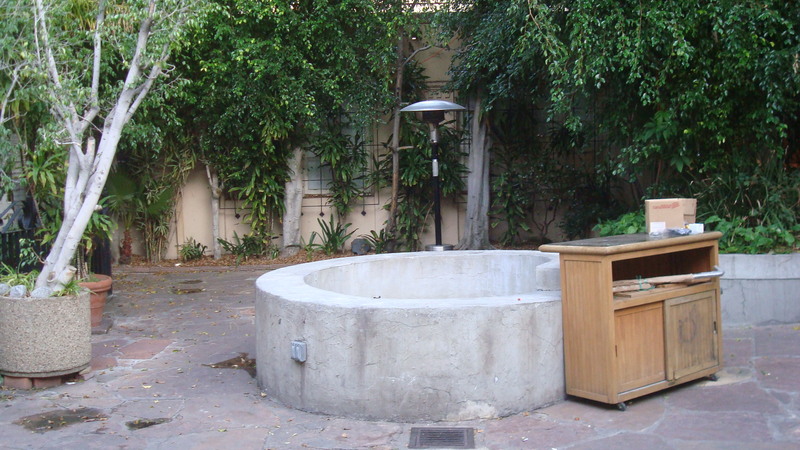 The photo of the Oswald Bartlett House was taken by Michael Locke, who has spent a fair amount of time documenting the Los Feliz area. To see more of his work, click on the link below.